Its Mid-November in Ottawa and the weather has been unseasonably warm. We should have had a snowfall by now, but its warm enough that a leather jacket and scarf is all one needs really to stay warm. Not that I am complaining or anything, I do better when its warm. I just doesn’t feel like we are in “Ottawa” anymore Toto. 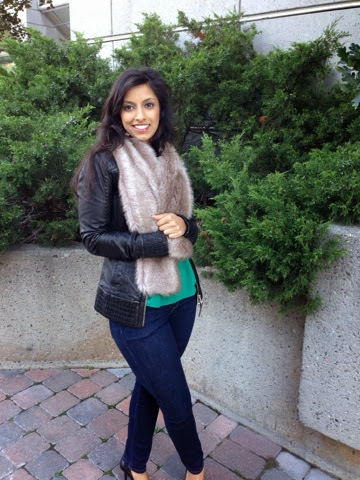 Faux Fur Stole: RW & Co.
needed was a light jacket. We shouldn't complain though - it'll be minus 40 before we know it! Emerald green is your colour!! I feel like I may have jinxed us! 25 cm of snow! Yokes! Emerald is a beautiful color on you. You styled your jeans very classy. Love the faux fur stole! And I am so confused by this weather. Some morning it's FREEZING, and the next day it's mild enough for a sweater. What is happening??? Lovee the faux fur Nisara! It looks so good on you! This is one of those outfits that'll make both guys AND girls turn their heads. I could pretty much live in skinny jeans, a pretty blouse, leather jacket and warm scarf, so I am LOVING this.